This year, I set out with a goal. It was quite simple really. All I wanted to do was raise money for the Special Olympics of North Carolina as part of the Duke MBA Games (and raise more than we did last year). I thought that by using social media, I could raise awareness, and ignite passion in my followers to inspire them to donate to my cause. 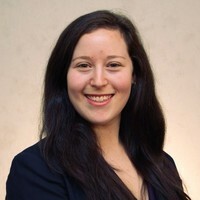 I created a special Twitter handle and Facebook page for my MBA’s fundraising team to centralize our messages. I thought, after doing all that, my teammates would assist in my efforts to raise awareness via social. Perhaps it was a combination of my teammates lack of enthusiasm, or low interest in Special Olympics on social, I can’t be sure, but my campaign never really took off. 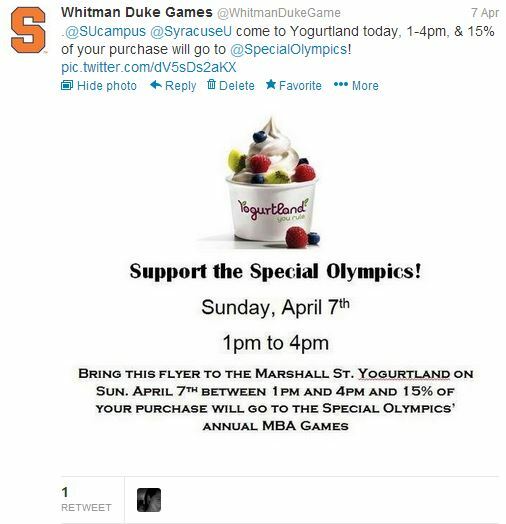 Before heading into this venture, I knew how to utilize twitter and implement hashtags, I knew that I should mention people that were influential in the cause (IE Special Olympics, Special Olympics of North Carolina), and influencers on campus (Syracuse University). Some of my posts got good responses, but for the most part, there were only a handful of people that interacted with the posts on a regular basis (including myself). I rarely got responses from the university, or the Whitman school, even though I constantly mentioned them in my tweets. 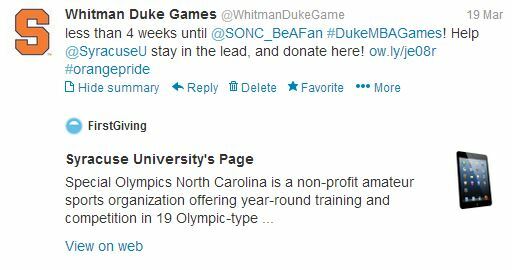 More often, I got interactions from the Special Olympics of North Carolina or Duke MBA Games. Below are some key highlights. In terms of Facebook, the key was getting people to like the page. I thought that my classmates, especially those who were on the team in the past, would immediately like the page. I was surprised to learn that very few of them took the effort to click “like”, even though it was such a simple thing. Although many more of my interactions took place on Facebook, I thought they would reach a larger audience, with more people sharing, liking and commenting on my posts. I had high hopes when starting. I believed in the power of social media, and thought that I could use it to reach out to others who believed in this cause and encourage them to donate. Perhaps, due to my naivete, I wasn’t fully prepared to handle what I was trying to do. I also believed my school and teammates would be more involved in the effort, and would help try to spread the word on social. Keeping people updated on what we are doing and our fundraising progress is what I would think people would what to see when donating to a cause. Although I essentially “failed” at running my first social cause campaign, I have learned what ‘not to do’. In many ways, I believe that is just as – or more important – than running a successful campaign. When doing something wrong, the lessons stick with you more, because you don’t want to fail again. When you succeed, although you want to succeed again, you don’t know what it feels like to fail. In a way, this might be the bigger win, and I’m glad it happened.